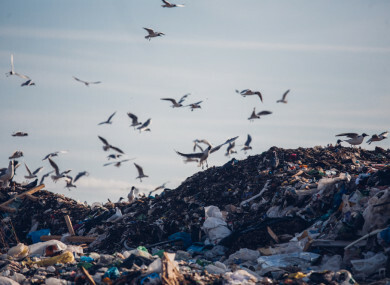 IRELAND IS APPROACHING zero capacity in its landfills, Minister Denis Naughten is expected to tell an environmental conference today. In his address to the Environment Ireland event in Croke Park this morning, Naughten will outline Ireland is approaching an emergency waste situation if the country exceeds projections. In 2011, Ireland had 127 working landfill sites. Now there are just four, with two taking the bulk of the country’s waste. Last year, in a bid to move away from the reliance on landfill sites, the minister rolled out the use of household brown bins. At the time, he warned that in just three years, there is going to be a 17% shortfall in landfill. “Effectively meaning we will have no landfill capacity for two months of the year,” he explained. Naughten said too much food and organic waste is ending up in the regular black bins. In order to ramp up recycling, all waste collectors were required to start rolling-out food and organic brown bins to all localities nationwide with a population greater than 500 people. In his address to the conference today, the minster will outline that Ireland is still producing too much waste. The months up to Christmas are the busiest time of year for waste production. While Naughten states that Ireland is currently managing, there are fears we could be approaching crisis point. The minister will also outline new plans to tackle plastic waste. The latest figures show that Ireland is the largest producer of waste plastic in Europe — totalling 61kg per person per year, according to Environment Ireland. Naughten will shortly bring a memo to Cabinet outlining a zero-tolerance approach to single-use plastics in government and State-funding buildings. Email “Ireland is approaching an emergency waste landfill situation, warns minister”. Feedback on “Ireland is approaching an emergency waste landfill situation, warns minister”.